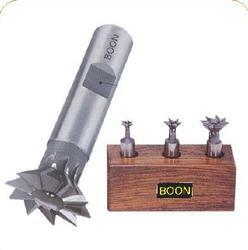 We are able to manufacture a large variety of dovetails cutters in single and double angles which are made out of finest grade raw material and as per customers requirement. We are the best in this market for offering the best array of HSS Dovetail Milling Cutter for our desired clients. We are offering a wide range of dove tail cutters, which is widely used for milling or profiling for dovetailing slides of machine tools. These cutters are highly appreciated by the clients for their dimensional accuracy, tensile strength and longer functioning life. These are manufactured by our professionals as per the set industrial standards and are available in different sizes. Dovetail Milling Cutter with 45°, 50°, 55° and 60° are manufactured from HSS in Regular - Form A and Inverted - Form B types conforming to IS:6255-1995 / DIN 1833. 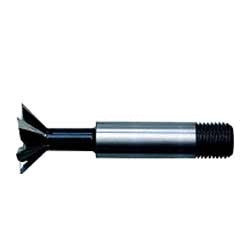 We provide Dovetail Milling Cutter at market leading price. Designed to produce dovetail slideways in machine tool tables, jigs and fixtures. Bright finish, straight helix. Made to DIN 1833. Shank to DIN 1835D. Our unwavering commitment towards offering premium quality range of Dove Tail Cutter has enabled us to mark our name in the list of top notch firm of the industry. We ensure to deliver products to the clients as per drawings at affordable prices and within the prescribed time.